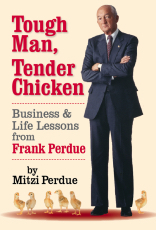 After years of hard work and ensuing success, Mitzi Perdue offers unique and poignant insights to leaders and readers around the world through her biography of Frank Perdue, who revolutionized the chicken industry. Frank Perdue did chores as a child so young he needed two hands to hold a single egg. But from these humblest of beginnings, he built an empire that today spans the globe. Due to his intuitive sense of the market, there is hardly a person over the age of twenty-five who doesn't know the tagline, "It takes a tough man to make a tender chicken." Frank Perdue was an extremely thoughtful and thorough businessman. He studied every possible angle of business strategy, getting advice from every possible source, before making an important decision. This is his story, and also a personal story regarding the bond between Frank and Mitzi Perdue. A true case of love at first sight -- they were engaged within 24 hours of their first date -- and a remarkable partnership. The rich combination of Frank Perdue's life and career and the lessons he imparts, along with Mitzi's journalistic talents, allow this book to resonate on multiple levels -- as a biography, as a business book, and as the tale of a one-of-a-kind American entrepreneur.